It’s a late lunch break for me here in Hobart Town. I’m off to find out more about North Hobart Football Club. 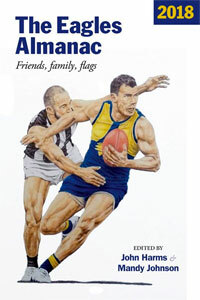 In 2012 M Flanagan wrote a story of the club’s character and corralling by the Tasmanian football league administration. The proud old club faced demise. It piqued my interest (it’s here). Today, navigating the Tasmanian State League webworld for North Hobart offers no clues. All I discover is that a side called Hobart City apparently now plays out of the old North Hobart Oval. I’m on foot today setting off from central Hobart. Just in that café there a world record was set for most cappuccinos poured in one hour. A Guinness World Record certificate hangs: last November, Sue, 289. The shadows are long. It’s Winter Solstice Eve. There’s music in the Elizabeth St mall. The Brunswick Hotel looks to have done a reasonable trade on Friday lunch. A sign advertises a deal on a “Parmi and pot.” Parmi? Shouldn’t that be Parma? Adjudication please. The walk takes me rapidly out of the CBD and I’m now among car yards. A mechanic is well positioned. Astride it all, Mt Wellington looms timelessly. Splendidly. Four lanes of one way traffic fizz past. There are few people as pedestrians here. Up the valley I go. A motorcycle shop now. And a car wash. There’s the smell of woodsmoke in the air. Eucalypts line the northern hillslopes. At the top of the Argyle St hill, I seek directions. “No alcohol in this park” proclaims a bright, impossibly clear sign. Yet this man puts his open stubby down as I approach. – Just up there, mate. Keep going. You’re nearly there. The odd headlight is flicking on and it’s 3:34pm. And suddenly, here I am. Enormous iron gates stand open. I’m in through the car park and onto the ground. Three stands, plenty of outer. I’m at the southern goals, where the home teams run on, from under the old Horrie Gorringe stand. Brilliant name. This is North Hobart HQ. The less salubrious but impressively named Roy Cazaly stand rests in the south-eastern pocket. The western outer wing rises on the back of a hill. Standing on the asphalt rise I’m looking across the ground to the Derwent estuary. Superb. A ridge of eucalypts runs behind the northern end. There’s a stand down there too, behind the goals. When I get there, it’s hard to decide which is the best view, for now I see Mt Wellington as the southern backdrop. Sheesh. It’s a cathedral. Unsurprisingly, the centre of the ground is the best spot to be. 360 degree sights. Walking off the ground as an imaginary North Hobart player, I step right up to the club social rooms and find them open. And here’s Nigel. He’s preparing for a function. Trophies and honour boards and red and blue premiership flags adorn the large room. I’m in a shrine. – G’day. I’m just down from Melbourne. Dave. – I’ve heard of North Hobart. Do you mind if I have a look around? – Go for your life. Nigel. There’s 1902 premiership photo. And many, many more. A very successful club. It’s impressive. But I’m struggling to get my bearings. – North Hobart used to play here, right? Now it’s Nigel’s turn to feel lost. – Err, North Hobart is alive. We own the team. – I’m confused. There’s no North Hobart playing this year is there? – No. Ah, no. Last year the league told us to enter a side along with the Hobart club. To be called Hobart City. Two clubs together, see? But then Hobart pulled out. So now it’s just our team. It’s a North Hobart team. But we have to call it Hobart City for three years. Part of the agreement. Ahh. And yes, Hobart did pull out. I had it confirmed by Fred, my 65-year-old (my approximation) taxi driver. – Yep they pulled out alright. They entered the more local Southern Football League. That’s a North Hobart club there at North Hobart oval, don’t you worry. 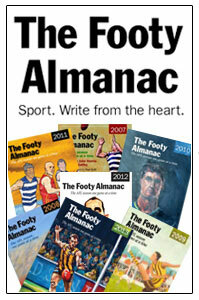 Fred reveals himself to be a living, breathing footy almanac. – I was there at North Hobart, you know, at the 1966 ANFC carnival. – Yes, there was Tasmania, Victoria, South Australia, the West, I think the VFA had a side. One game we had that real low fog all over the ground. When they ran on you couldn’t see the two teams. – The big game was Tassie versus the VFL, of course. 26,500 were there. Squeezed in, we were. It was the only time I ever saw Teddy Whitten play. He played injured. Started at full back. Then centre half back. Worked his way into it. He played on the ball and then down forward. He kicked goals. It was brilliant football. It was like when Geelong smashed Port in the 2007 Grand Final. The result was a smashing. But the football was brilliant. It seems I’ve landed the footy-yarn jackpot. – I see Roy Cazaly played for North Hobart. – Oh yes. And Johnny Leedham. Don’t forget JL. Never played VFL, big JL. Oh, he was the best. Long, raking left foot drop-kicks. – Oh we’ve had a lot who made it big. Lots who didn’t try. Look at Royce Hart. Royce Hart never played senior football in Tasmania; Richmond got him as a junior. – But Peter Hudson, well, he had to be coaxed over to Victoria. Lived up there in the upper Derwent valley. Had this mentor; Trevor Leo, at New Norfolk. And Peter had a job, you see. Had a job with the bank. It meant he couldn’t get to training on time, so Trevor used to take training once with the main team, and then again with Huddo. A mentor, he was. One-on-one coaching. – Oh he always kicked flat punts. But they were accurate. – And he could read the flight of the ball. That was his gift. You’d see a pack of half a dozen with the ball coming in, and low and behold, Peter would emerge with it. It was uncanny. – Uncanny judgment is what he had. It’s been an educational taxi ride. Terrific. But it’s over. We part well. North Hobart, presently playing as Hobart City (4 wins, 6 losses), is sitting seventh in the 10 team Tasmanian State League. Last round they beat ninth placed Launceston (2-8) at home. This week they meet sixth placed Glenorchy (5-5) away. Earlier, with Nigel in the North Hobart social rooms, he’d told me that North Hobart not only had old roots, but were putting down more. – We just spent $1.25m on the surface and drainage here. – Ah, so you’ll be here a while yet? – I should think so. 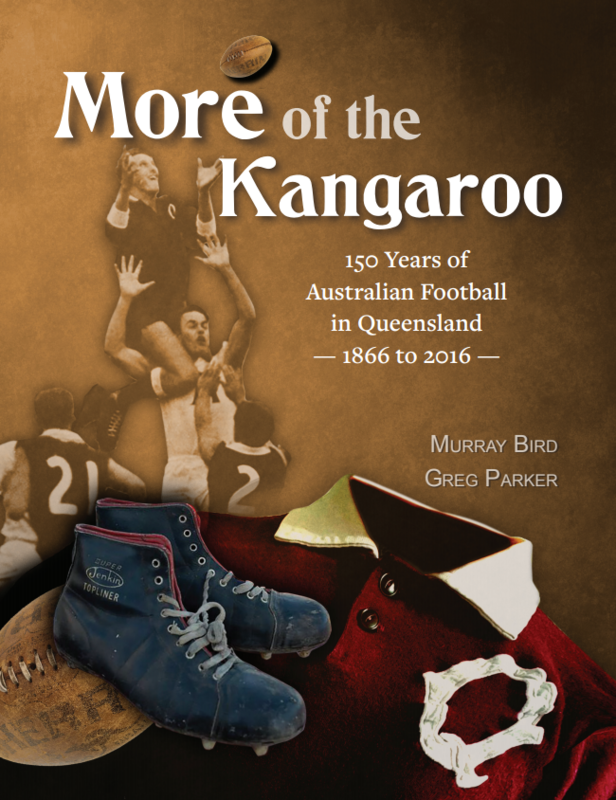 – We’ve got a great book of our club history you might like. – Ahh, I’d love a copy. What’s it called? Thanks David. Sounds like a instructive, if somewhat bewildering trip. Indeed the Victorian “parma” is a “parmi” in South Australia too. JTH and others are correct: Australia is many nations, not one. I’ve just finished “The Sportswriter.” What an enigmatic, funny, sad novel! I work with a guy from Hobart and he is dismayed by the changes too. But, I guess, most football leagues are in flux. Hmm. I’m told it’s “Parmi” at the Toora pub, as well. So much footy history and passion in Tasmania. It’s a real shame that the Australian Football League hasn’t established a presence there, really. It also appears the team that was intended to replace North Hobart and Hobart as separate entities all too often get belted by triple figure margins. I often read that a lot of die hard fans of Tassie footy are bemoaning the trashing of history to fit soulless uncompetitive outfits. Great read e.R, did you go down there just for that reason? Fantastic David. I went to a North Hobart game at North Hobart Oval in 2004. What a wonderful place, great atmoshere even though there was probably only 2000 there. Got talking to a guy in the crowd and he mentioned North were the “Collingwood of Tasmania”. That was enough for me, kept an eye on them ever since. Can’t understand what is happening down there, not a fan of established teams with tradition being replaced by new ‘franchises’ ala the Big Bash League. By the way, what a wonderful city Hobart is. I love going there. The old pubs, the gardens, the markets, the bay, the Cascade beers that can’t be bought on the mainland. Can’t wait to get back there. Luke – I was told the same thing. 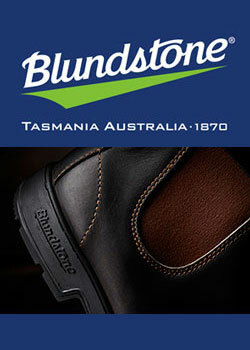 The Collingwood of the Tassie scene. Horrified to learn that they wear red and blue & sing It’s a Grand Old Flag. Timeless city. OBP – refer to Smokie’s parma. Agreed on the importance of club. Phil – Loved that clip.I’d forgotten. D Monkhorst v J Manson in ruck. G Wright and D Barwick pinging them through. The footy holds up, I reckon. Thanks Dave, a terrific discovery trip of yours. Love catching a glimpse of old, footy grounds – there’s some terrific angles in Hobart to catch the North Hobart ground. Maybe next time you’re here try the view down from the nearby Queens Domain. You can check out the TCA Ground while you’re there, home of the Hobart Tigers and once the home of the TCA. At least the name of the ground has remained, even if the Association has skipped across the Derwent to Bellerive. Have only been to one game at North Hobart Oval so far, a rugby league trial match two seasons ago between the Storm and Broncos. Almost 12,000 paying punters turned up, making for a wonderful atmosphere and an insight into those big aussie rules crowds that must have brought the place to pulsating life. The Royboys played a few games at North Hobart Oval in the early 90s, attempting to stave off collapse and explore possibilities for relocating. If only…. David – I really enjoyed this piece. Reflective and evocative is the way I like to see things. When I read it as the draft you took me on my own wanderings. Recently I went to a distant friend’s 60th birthday in country WA footy clubrooms. Others chatted as I wandered the walls looking at photos and musing on stories and histories. Old premierships but the one I found most poignant was the lad in the State Teal Cup colours only a few years ago. On the Dockers list for a few years for a couple of games. Bad knees? Bad habits? Who knows? Content? Gutted? Who Knows? I find myself going on random odysseys like yours and asking who are we? Who are my people? Where do we come from and what drives and sustains us? It is at the core of my bigger questions of identity. Who am I and where do I come from? Who are my people? What drives and sustains me? Really nicely evocative, you’ve got the walk from the city up to North Hobart spot on. I could exactly picture everything. Hobart, great little city, shame about the football administration. Oh, and since the root word is ‘parmigiana’, I reckon that makes it ‘parmi’. Can someone please explain why the AFL believes that AFL footy won’t be sustainable in Tassie when you see a crowd like that in the video of the Apple Isle’s win over the Big V? Fantastic footyage by the way. The Taswegian stars were all overjoyed but humble. Thanks for the piece Dave, really enjoyed it. She Who Must Be Obeyed talks of going there often as a girl with her grandfather to watch Glenorchy and eating musk sticks under the grandstand. Many years later one of her brothers had his wedding reception there, and a fine night that was. It must surely lay claim to being in the top few most beautiful footy grounds in Australia. A bit of a shame that it couldn’t have been developed into an AFL standard facility, but on the other had I suspect that would have just ruined it anyway. I’m obsessed with Tas at the moment. This was brilliant – and timely. Thanks old mucka. G’day Adam – nice tip. I’ll check it out. Fred driving the taxi was full of TCA and international cricket stories, too. He thought it fair enough given that Hobart had been declared the cricket headquarters of the state, that Launceston be given the focus of (AFL) footy. Mainlanders often don’t get the north/south divide. PB – thanks. What gives us meaning? Powerful stuff. The essence of it all. Mark – a linguistic technicality. I don’t buy it. What about the pronunciation? Never heard anyone ask for a “parm-i-a-gana”, but plenty of “parma-gana”. Parma. Tom – never heard a coherent answer to that. Lots of speculative excel forecasts based on (i) Grand Prix -style “benefits to the community” calculations of the expansion lands and (ii) absence of the spending dollar in Tassie. Many assumptions. Not too much around passion nor history; they’re hard to pin on a spreadsheet. Rob C – brilliant wedding reception recount. thanks. Cookie – when do you leave? Struck a chord with me David. Thank you. Enjoyed very similar experiences about ten years ago. Probably Fred and Nigel too? I was also alerted to a fourth famous stand (much smaller) on the high side forward flank. It was an old wooden one man pie kiosk. A closer inspection revealed the following inscription above the National Pies headboard. In italics . . . The”Percy” Jones Stand. I spotted an enormous National Pies sign. Important questions of administration and strategy for the Tassie State League in amongst all this. The AFL, too. The nature of club. Of belonging. The furthering of the code. All pieces of a giant puzzle. With repercussions. 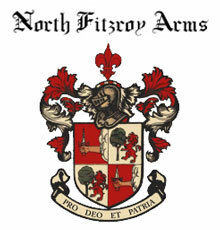 A formal step back to a former identity. Great to hear. All that’s needed now is the change back to North Hobart. As an old past NHFC player it is sad. Tradition gone. 125+ years gone because the club had no balls to stand unto AFL Tas. I personally won’t go back till they are back as the North Hobart Demons. Im no past player of Hobart City. The team i grew up with and played for as far as I can see is gone. Thanks for posting, Past player. There’s a bit of this about. The whole box & dice changes when the corporates grab it. A really sensational piece of writing David that really evokes emotions of my upbringing around being a Hobartian footy loving kid. And a lot of home sickness! I played my juniors with the mighty NHFC. Used to make the same walk from the city to NHO up argyle st after school in under 15s to sit in the Ryde St stand with the boys before training would start.. and the same walk on 2008 Grand Final day with my family to watch us play Glenorchy. Myself and one of my best mates (who both went on to play seniors at North) had been waterboys for the entire finals series including the thrilling second semi win against Glenorchy at KGV. Fair thrill on GF day for a 15 year old to run around (even only with water) in front of 8000 people! unfortunately our first 5 scoring shots yielded us 5 behinds, Glenorchy’s 5 goals. We got done pretty comprehensively. I progressed up the juniors at North, playing in an under 17 premiership side that yeilded 1 AFL draftee, 5 Tasmanian under 18 reps and 11 future senior players in 2009. I was lucky enough to play my first senior game about 6 weeks before my 18th birthday at Aurora against North Launceston in 2011. I was never one of the greatest players to pull on the red and blue by any stretch but being senior player #915 at the greatest and most famous club in Tasmania is something I’m hugely proud of. It’s been well documented what happened to my club, and how a complete witch hunt from a hostile governing body that forced a club with 208k in the bank coming off 10 out of 11 years of consecutive profits to be forced into firstly try to merge, then pushed the members into a corner by saying there was no way we could continue in the TSL as NH, as well as closing the door to the SFL. Despite that year (2012) being my last year in Hobart (I’ve been in Melbourne since), the injustice still burns fiercely at me and has implanted a burning desire in me to get our identity back. We now have our chance to do so. If we succeed, there is nothing that will stop me being there at NHO on the day of our first home game to see the mighty NORTH HOBART FOOTBALL CLUB est. 1881 go around. My heart will always beat true.